It was just recently that I posted my top 10 board games ever, and many of those games go on this list, so I won’t go into too much detail. This is a list of my favorite games that I played for the first time this year, regardless of the year in which they were released. I haven’t included games I designed or published. This list was harder to create than I thought, because not only did I play a lot of games this year, but also because a lot of them were really solid games. There are quite a few really solid games that didn’t make the list. Given the number of games I played that were released in 2015 or late 2014, I’m going to leave off games that were released well before that; namely, El Grande, Battlestar Galactic, Going Going Gone, Animal Upon Animal, and Rococo, all of which may have made this list. 10 (tie). Forbidden Stars and Funemployed: I’m giving this one a tie mostly for my own enjoyment, as these games are polar opposites of one another, and I don’t always want to play either of them. Forbidden Stars is a 5-hour epic space 4x game with one of the best (yet most arduous) combat systems ever, and Funemployed is an activity about making ridiculous job pitches. Both are fun in very different ways. 9. Dimension: Dimension is an abstract game about stacking balls on top of one another to form 3D pyramids that meet the requirements of random objective cards. It’s such an interesting logic puzzle, and I found myself smiling the entire time I played it. 8. Blood Rage (video): This game is at the top of many reviewers’ 2015 lists, and for good reason: It’s a great blend of drafting mechanisms and area control, complete with beautiful miniatures. 7. Orleans: Orleans is a really elegant engine-building game where you’re drawing an assortment of workers out of a bag (your own bag) each round before deciding where to position them. I love the simultaneous play, and any game where order of operations matters is one I’m sure to enjoy. 6. Camel Up (video): I love that this is a racing game where you’re betting on the camels (you are not a camel). Because of that, it feels a little bit like craps, because you’re rooting for specific camels together with other camels. It’s super easy to learn and plays up to 8 players. 5. The Voyages of Marco Polo (video): I go back and forth between this and Orleans as my favorite Euro game of 2015, but I think this one wins it. Marco Polo is a colorful dice-placement game with vastly different variable player powers, and it’s a ton of fun to play without hurting your brain too much. 4. Codenames (video): Every time I play Codenames, I’m reminded of how good it is. The premise is so simple: There are two teams, each of which has a codegiver who knows everything and may only say 1 word and 1 number to their teammates. Those teammates look at a display of cards and try to figure out which cards the codegiver is referring to. Like, the codegiver may try to get his teammates to selected the cards “whale” and “DJ” by giving the clue “Moby 2” (2 is the number of cards). It’s so simple, but so much fun. 3. Pandemic Legacy (video): I love legacy games. “Legacy” means that something you do in one game carries over to the next session–some of your decisions are permanent. Doing this in a cooperative game like Pandemic makes it a particularly special experience since you’re making those permanent decisions together with other players. Plus, the game has a great plot. Brilliant game. 2. A Fake Artist Goes to New York: Spyfall was a pretty hot game this year, but Fake Artist is my top pick for bluffing game of the year. In fact, I tried to acquire the rights to it, but Oink Games isn’t budging (deservedly so–it’s a great game!) The idea is that players are collectively drawing a picture–the same picture–but one of the players doesn’t know what they’re drawing. That player (the “fake artist”) is trying to blend in and not be outed, while the other players are trying to draw just enough that they aren’t falsely accused and not enough that they give away the picture to the fake artist. It’s a wonderful push and pull. 1. 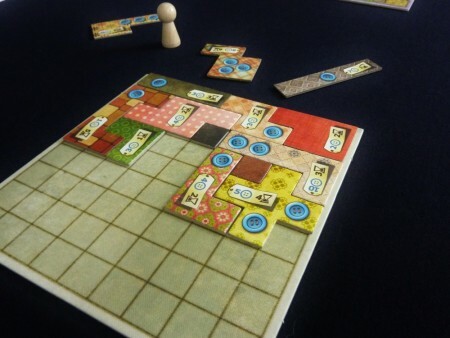 Patchwork (video): This is the best 2-player-only game I’ve ever played, and it’s my pick for my favorite game of 2015. You’re trying to fill in as much of your quilt as possible before running out of time (time is a resource in the game, along with buttons, of course). Every decision has drama and tension to it, and on almost every turn I feel a little burst of endorphins from doing something clever. I’m giving away two copies of this to my family as Christmas presents this year–you know you love a game when you buy a bunch of copies for other people. What were your favorite games of 2015? This entry was posted on Monday, December 21st, 2015 at 8:07 pm	and is filed under favorites and tagged with board game, favorites. You can follow any responses to this entry through the RSS 2.0 feed. My favourite games from 2015: Voyages of Marco Polo, Haspelknecht, Steam Works. Great list Jamey! I think Marco Polo took my game of the year. My wife and I play it often together and we both enjoy it greatly, even when we play terrible. There is this undertone of a race game in it which is so unique and challenging at the same time. Pandemic Legacy is in a world of it’s own and a masterpiece. Really enjoying Isle of Skye and Food Chain Magnate is brilliant. It might of took game of the year if we played it more. It’s a beast of a game that is fascinating. Also logged 12 plays of Viticulture/Tuscany this past year and looking forward to another dozen + plays this year to get through the rest of Tuscany. It’s perfect Jamey and we LOVE the new board. That opened up a whole new surprise of a game. Can’t wait to explore all the modules and strategies as we keep playing. Best to you and Stonemaier Games in 2016!